10 Best Closet Systems, According to Architects & Interior Designers - The Organized Home. 10 best wardrobes - The Independent. 37 Luxury Walk In Closet Design Ideas & Pictures - Don Pedro Home Design. 49 Richlin Luxury Wardrobes - Pinterest. 101 Luxury Walk-In Closet Designs - Home Stratosphere. 420 luxurious closets - Pinterest. 47,162 wardrobes Home Design Ideas - houzz. Best Closet Systems & Organizers - ConsumerAffairs. How to Make the Most of Any Closet - "Cluttered closets? These clever storage solutions (and, before that, a purge) will make them feel bigger and work better." 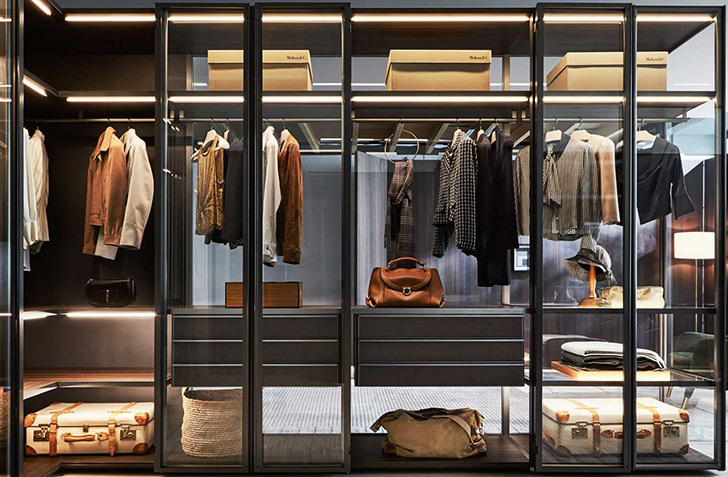 The Walk in Closet & Wardrobe Systems Guide - Gentleman's Gazette. Artemest - "The Online Destination for Timeless Craft: meet Italy's finest craftsmen, shop one-of-a-kind pieces." Boffi - "Boffi SpA since 1934 kitchen, bathroom and system collections for high end contemporary furnishing." Italian design. California Closets - since 1978. "Closets and space solutions for the bedroom, home office, garage, pantry, mudroom, media center, and more. Now introducing our new Lago Italian Finishes, color, grain, tone and texture details add a look that enhances any décor and individual style." Chaplins - "Reach new dimensions with our sophisticated selection of designer wardrobes. All of our installations are designed to maximize space without compromising on aesthetic. Our gorgeous collection of contemporary wardrobes harness innovative design to guarantee ample storage space and an immensely satisfying user experience." ClosetMaid - since 1965. "Offers innovative wire and laminate/wood storage systems for use in bedrooms, kitchens, family rooms, laundry rooms, home offices and garages - wherever people need to store and organize their things." EasyClosets - since 1999. "Easy to design, easy to install, easy to love. That's our promise to you! We'd love to help you with your next home organization project!" Closet organizers, garage cabinets, laundry room solutions, kitchen pantry storage, home office & living spaces. Elfa - offering flexible interior products and made to measure sliding doors for your entire home. henrybuilt - since 2001. "We believe our homes should be good to the core, not just look good on the surface. They should use refined materials and technology, but they should be approachable. They should be long lasting and as repairable as possible. They should be personal, but leverage the quality and design advantages of well-engineered systems." HÜlsta - "The innovative wardrobe system MULTI-FORMA II is particularly versatile and offers interiors to exactly fit your requirements and your home. Numerous front designs and unique intermeidary units make MULTI-FORMA II both extraordinary and exclusive." Lago - "LAGO wardrobes do not even seem like wardrobes, thanks to the innovative use of materials like glass and fabric." Made in Italy. Lema - since 1981. "Modularity and customisation are the key words of Armadio al Centimetre, LEMA’s original a made-to-measure wardrobe that delivers utmost freedom in terms of design and personalisation." Molteni & C - since 1934. "Designer Wardrobes. Modern Contemporary Design." Poliform - since 1970. "MY LIFE choose your style, make the difference." Made in Italy. Luxury wardrobes & walk-in closets. Porro - "The intrinsic ability to interpret wood, offering an incredibly wide range of finishings, since 1925." Italian Design. Dressing Rooms & Storage Closets. Solid Wood Closets - since 2006. "Closet Organizer and Closet Systems made with real 100-percent Solid Hardwood, with DIY (do-it-yourself) installation."